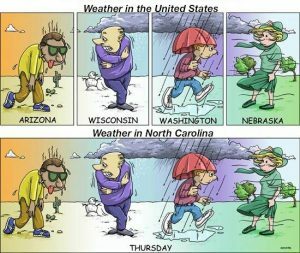 If you’ve lived in North Carolina for at least a year, then you understand why there is so much fuss about the weather. Between the colder temperatures of the Appalachian Mountains in the West, to the subtropical climate of the beaches along the Coast, North Carolina weather ranges from cold and snow to hot and humid, with tornadoes and hurricanes thrown into the mix throughout the year. Even for those of you who have lived in the state for several years, the weather discrepancy still takes some getting used to. Springtime is particularly vexing. Beginning in late February, the nights are still frosty while the days jump to the upper 70’s. Basically, you have to prepare several outfits for a 12 hour span so you don’t sweat through your jeans and winter coat by 2 o’clock in the afternoon. The general consensus on coping with these temperature changes in your home throughout the day is to install a programmable thermostat that schedules temperature adjustments automatically. So while you are away at work and the kids at school, your house can preserve a comfortable temperature while you’re saving on your energy bill. So no, it is not harmful to program your thermostat to adjust your household temperature. However, if you are not programming effectively then there is a chance you can upset your system. Things to consider for programming your thermostat. What is your thermostat differential? The thermostat differential is the temperature gap between activation and shutoff. For example if you set the cooling temperature in your house to 78 degrees F, the air conditioning might kick on at 80 degrees F, and then turn off once cooled back down to 78F. This is a differential of 2 degrees. A common issue that occurs with this is short cycling, which is when the temperature gap is too small and the system is constantly being turned on and off, causing wear and tear. Depending on your differential settings, you might need an HVAC technician to set this up. What type of heating/cooling units do you use? High efficiency furnaces and air conditioning units have varying levels of efficiency for heating and cooling power compared to older models. It might not be a bad time to update your air conditioning system if it’s been slow to kick in, giving you trouble. Otherwise, taking into consideration the age of your heating and cooling systems might affect the scheduled programming of your thermostat. Where is your thermostat placed in your home? It’s important to consider the size of the rooms you’re adjusting the temperature of throughout the day. Large rooms require more energy to heat or cool down, so drastic temperature changes are going to increase the amount of energy used. Also, the placement of the thermostat – either by windows heating up the space, or alternatively, near air conditioning vents cooling down the space, will again lead to short cycling. You may not be able to control the weather, but you can control the temperature within your home. Pack up your several outfits for the day and adjust your thermostat to a comfortable setting, somewhat agreeable with the outside weather. You’ll find that your HVAC systems are working efficiently and your energy bills are lower than expected.